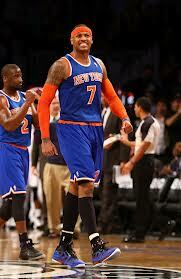 The Knicks hope the tear in Carmelo Anthony‘s shoulder can heal on its own. If not, Anthony might need to undergo surgery. And that surgery could sideline Anthony for the start of the regular season, according to one veteran orthopedic surgeon. The current plan in place, according to a league source, is to have Anthony rest for the next few weeks and see if the injury improves. So if surgery is necessary, it likely would not take place until late June. This entry was posted in Articles and tagged Carmelo Anthony, carmelo shoulder, KNICKS, KNICKS MEMES, Knicks news, melo surgery on May 29, 2013 by Tommy Rothman.